In just a couple short weeks on the 4th of July Kent and I will be celebrating 25 years of marriage. I will turn 43 right before our anniversary so if you do the math you will quickly figure out that I had JUST turned 18 when we got married. On the 30th of this month we will be heading to Puerto Vallarta with both sets of our parents and our amazing friends to celebrate our anniversary and renew our vows. This is where you come in on the story. When we got married in 1987 writing your own vows was not the phenomenon that it is today (and frankly I was a little clueless on how to really plan a wedding) so we said the vows that were laid out in the little book our officiant used. Our wedding was at noon on the fourth of July and the whole wedding party wore white (If you think of Adam Sandler in the wedding singer you are probably kind of close). It was beautiful and I was thrilled. 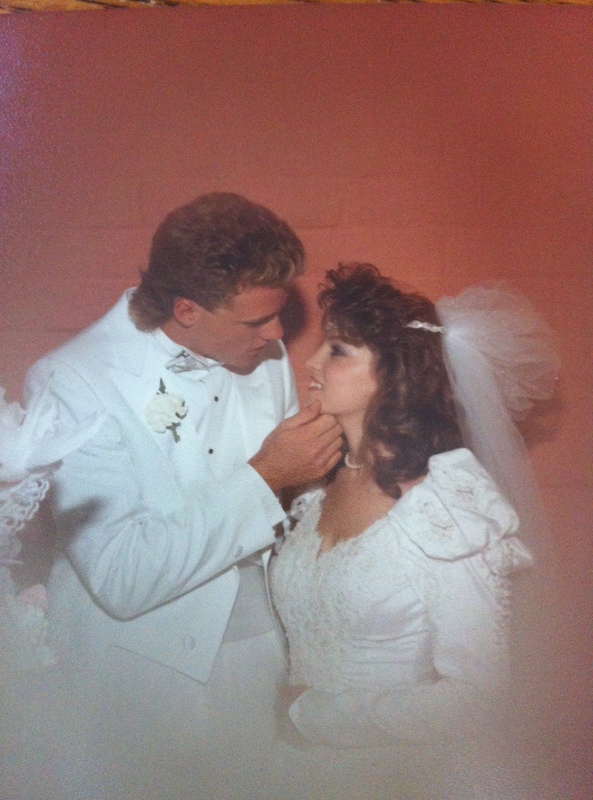 I had no idea what the next 25 years would hold, but I knew one thing on that hot day in Moreno Valley, CA, I loved Kent with all my heart and I intended to be with him forever. Everything I knew at that point about marriage I had learned from my parents and grandparents and I had amazing examples. I can tell you though, watching someone else be married and being married are two completely different things. I had no way of fully knowing the amazing, powerful, difficult, glorious, challenging relationship that is marriage until after that day and I am still learning more all the time. I have been thinking about them ever since we decided we wanted to take this trip and renew our vows standing on the beach. I have thought and thought and have written n o t h i n g.
My struggle is how exactly to put into words all that it means to me to be married to Kent? How do I sum up in feeble speech this spectacular, insane, beautiful ride that has been our life? What can I say to make him understand how I feel about him? It sounds so cheesy but I sometimes wonder if he really gets it. Don’t get me wrong, we have our oil and water moments. (Let me tell you, being married to me isn’t easy for someone who likes order and organization.) I hate schedules, have messy zones, say yes to too much and live life by the seat of my pants (translation: I am fun to be around but I have a tendency to forget things). Kent is also ridiculously busy and spontaneous but as a general rule he is much more organized than I am (thank God). Part of our biggest issue is, as we like to say, neither of us makes a good secretary. But I will tell you this. There is no one I would rather spend time with or that I trust and admire more. Kent helps me be my best self. Kent is the kind of man I want our daughter to marry. It is not because he is perfect. He is not. He knows he is not. It is because though he is the same person I married he has changed in ways I never would have imagined or even known were possible in 1987. Together we have grown through workshops, college, faith communities and just plain living to question what we believe to be true and look at how we come across to others and adjust and shift. I have watched him in the last 25 years become more loving, more accepting, more humble and more wise. His support of me and my writing this blog blows my mind. He never asked to be part of what was happening here and honestly I didn’t even know what was going to happen when I started Word of a Woman on a whim at the end of last year. But his grace under fire and his defense of me to friends who think I have lost my marbles give me strength to keep going when I feel like writing people off and hanging it up. Over the years we have moved out of a church home in the dead of night, worked crappy jobs, moved hither and yon, had both our cars die on the same night, lost people we loved, watched our friends get divorced, dropped out of school, had health scares and hurt each other. But we have also made beautiful babies, finished college, drilled wells in El Salvador, lived in San Francisco and New York, driven cross country, danced, stayed up all night, been to Disney World, made love on a private balcony, given away more than one car, planted a church, written a song, made life long friends and grown together. I know what you are thinking, “there you go, you just wrote the vows!” Not quite, but I think I have a good idea where to start now. Thanks for helping me figure it out. I’ll tell you what my lovelies, when we get back from PV I will write another post about our little beach ceremony and share the finished vows with you. In the mean time. Live together and love each other deeply from the heart.